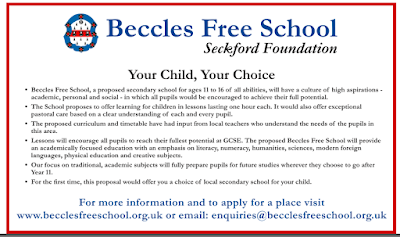 The Seckford Foundation have placed half-page adverts across much of the press in North Suffolk today for the Beccles Free School in a move seen by many locals as presumptive given that final approval has not yet been granted by the Secretary of State. However this Blog can reveal the number of applications made to Suffolk County Council for Years 7, 8 and 9. This is around half the number needed for the interim site at Carlton and a quarter of the original 108 per year group imagined. And that is if all these children actually go and given many probably applied before the news of the move to Carlton Colville that is unlikely. Having read this I must say I am pleased my children do not attend a school run by the Seckford Foundaton as they appear not to understand the difference between "facts" and "opinions". Here is a useful example for Seckford of the difference. 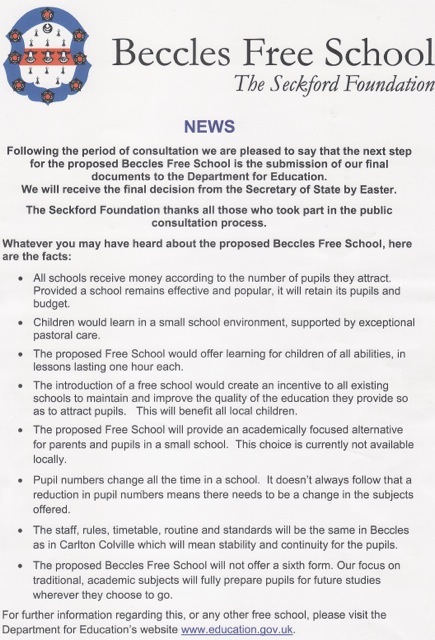 A fact is something verifiably true for example the statement "86 people had applied for places at Beccles Free School by 15 February 2012"
An opinion is a view or judgement formed about something that may or may not be based on fact, for example "the introduction of the free school would create and incentive to all other existing schools to maintain and improve the education they provide so as to attract pupils. This will benefit all local children"
Seckford are quite entitled to that view, I don't share it, but it is an opinion not a fact. But I think there are two main concerns here. 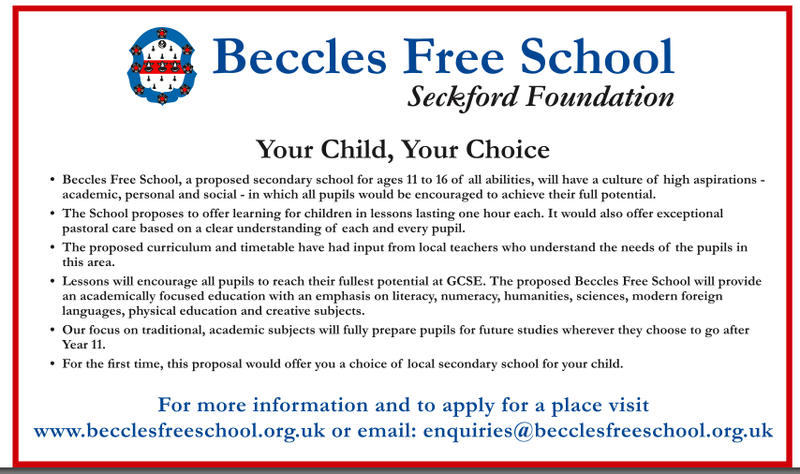 Firstly it appears that Seckford are using public money from the DfE to pay for these adverts. The free school pre-opening costs that the DfE will pay include "marketing and publicity". I called Seckford and asked them to verify this but "nobody was available to speak to me" and a promised call back was not received. Secondly there must be concerns that the local press are now at least somewhat beholden to Seckford, indeed they even ran an article about the adverts. An article in the Lowestoft Journal about the Carlton Colville public meeting pointedly failed to mention the failure of Seckford to turn up or even acknowledge the invitation. This has concerned several local residents who have been asking Archant journalists about the way they are covering the free school story by asking questions on Twitter. It is certainly true that previously they have published several articles critical of the school but is now the case that questions are being asked. Does this all mean the school is a done deal? It might do but equally it could be a form of pressure by Seckford on the DfE almost daring them not to approve it given the money they are spending...And if this is public money Seckford certainly don't seem to have much to lose. Except maybe their reputation.